Ask me what my favourite experience in Georgia was and you can be pretty certain the hike to Gergeti Trinity Church and Gergeti Glacier will fall among the pointy end of that list. Flicking haphazardly through a travel magazine some years ago, it was a photograph of this very spot dressed in a glistening blanket of snow that first landed Georgia on my radar. Now, it was the place I was most eager to visit. Perched on a mossy green hilltop surrounded by stark, spiky peaks, Gergeti Trinity Church is one of Georgia’s most iconic sights. Yet what I had not anticipated was that the mountains beyond concealed something even more impressive. The striking dome of Mt Kazbegi and Gergeti Glacier snaking down its front. Pair the two together and you’re in for one hell of a scenic hike. 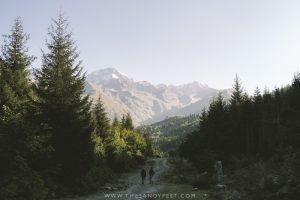 With an unforgiving uphill climb, a rapid increase in altitude and the temperamental weather that accompanies any mountain adventure, it’s a challenging one day hike, but it was also one of my absolute favourites in Georgia and undoubtedly one of the best day hikes from Kazbegi. Here’s everything you need to know to hike to Gergeti Trinity Church and Gergeti Glacier from Kazbegi. 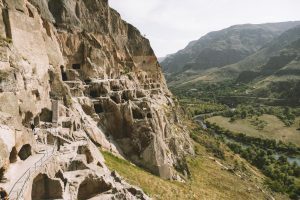 There are several ways to reach Gergeti Trinity Church – an impossibly steep and muddy scramble through the forest, an overpriced taxi and a slightly longer but less steep climb through the lush valley. Unsurprisingly, the latter route is by far the best option, unless of course it’s bucketing down rain, at which point the taxi might seem slightly more appealing. With the rapidly shortening days of early autumn to contend with, a vague hope of seeing the sun rise over the iconic church and an afternoon storm on the horizon, I set off into the fading darkness bundled up in all the layers I could get my hands on. From Kazbegi, cross the bridge and follow the Stepantsminda-Sameba Road for a little over a kilometre until you reach a fork in the road. Turn left and continue on past the houses, veer right to pass on the right-hand side of the crumbling stone tower and then stick right again to follow the steep, rocky path upward. Now, that might sound a little convoluted, but as long as you hit the right landmarks the trail is actually pretty easy to follow and should hopefully make perfect sense once you’re there. From here the trail continues upwards, hugging the contours of the vivid green hillside before reaching the road on top of the plateau where you’ll need to backtrack to reach the church. Take some time to explore the complex and enjoy the views and, even if you’re not hiking to Gergeti Glacier, I’d highly recommend you to climb the hill a short way behind the church for a slightly different perspective and a spectacular panorama of the formidable wall of mountains that act as a backdrop for Georgia’s most beautiful church. 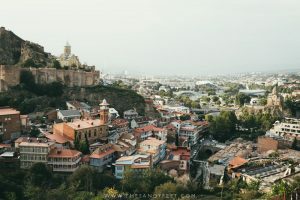 Also, bear in mind that if you’ve arrived in standard hiking attire – leggings or short shorts – you’ll likely be shuffled out of the church by the monks and asked to cover yourself before returning. The trail to Gergeti Glacier begins at the foot of the hill a short way behind the church. I’d love to say that you’re eased into the next part of the hike with a gentle climb, but, well, that would be a monumental lie. It’s pretty much straight up from here – steep, unrelenting and ridiculously beautiful. In all seriousness though, I wasn’t entirely sure what to expect from this hike and perhaps stupidly didn’t spare a second thought for acclimatising at all. This rapid change in altitude coupled with a few too many of those delightfully cheesy carbs might have had something to with why I was gasping for breath quite so heavily. All this and the fact that it really is a long uphill slog – 9 hours is an awfully long time to be teetering around on two feet after all – meant it was one of the more challenging hikes I’d done in a long time. Once over the first small hill, you’ll be clambering on up for the next 3 hours or so until you reach Sabertse Pass. The path isn’t signposted but is very well trodden and leads you through a lush green valley with unparalleled views of the church on its mountain perch and the wall of jagged peaks beyond. For the more adventurous, there’s also a second path that follows the ridgeline above the valley and reportedly offers up even better views. This trail is slightly more exposed though and winds can be severe. When you reach the rock field you can breath a sigh of relief knowing that you’re almost at the saddle at Sabertse Pass and the hardest part is behind you. It is from here that you’ll get your very first glimpse of the striking peak of Mt Kazbegi and the glistening trail of Gergeti Glacier slithering down its front. A sight that will make the last few hours of rasping breath and burning thighs worth it in an instant. 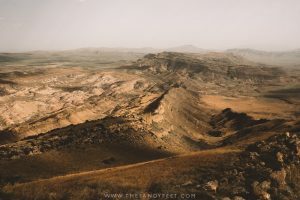 Having completed the toughest part of the climb and reaped the rewards of such fantastic views, Sabertse Pass acts as the finishing point for many day hikers. If you’ve had a late start, the weather looks set to turn or you’re simply running out of steam, this is a good point to call it a day and make your way back down. If that’s not you, it’s another 1.5 hours to the foot of the glacier. After such an early start and the long climb, I was feeling well and truly pooped by this point, but a short break and plenty of snacks had me raring to go again for the final stretch of the hike. From the pass, follow the trail slightly downhill toward the Chkheri River, fed by the icy glacial meltwater. Don’t try to jump it though – even in early autumn the river was absolutely raging. If you continue along the river banks you should find a small, slightly rickety metal bridge that will allow you to cross safely. Once across, continue uphill to the AltiHut 3.14, a new mountain lodge with an epic setting, before turning left and following the ridgeline toward the base of Gergeti Glacier. Setting foot beneath this enormous slope of frozen water matted with grit and inching its way across the rust red mountain face was something really quite extraordinary. You’ll see the avid mountaineers setting off across the ice with their sights set on the summit of Mt Kazbegi (a challenging 3-day expedition) weighed down by enormous packs piled high with ice picks, helmets, crampons and safety ropes. And then there are the everyday hikers who’ve followed them enthusiastically to explore only to realise that getting back down a steep wall of slippery ice is quite a lot harder than getting up it. While many people do walk across the ice, I wouldn’t recommend doing so unless you’re properly equipped or at the very least have a pair of hiking poles. Just a few steps had me sliding all over the place. To return to Kazbegi, simply follow the same route down, or take the alternate route along the ridgeline once you reach Sabertse Pass. While the trail is easy to follow and well worn, the route is also marked on Maps.Me which, as always, I’d recommend having on hand to keep an eye on your progress should the weather turn or you decide to turn back early. 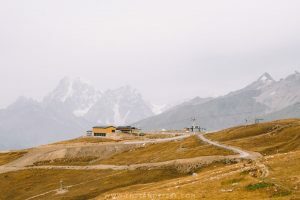 Acclimatise | I really can’t stress this one enough – don’t underestimate the altitude! Sitting at 3,200 m, the foot of Gergeti Glacier is hardly that high, but if you’re arriving directly from Tbilisi which sits around 500m and heading straight up the mountain from Kazbegi at 1,700m, that represents a huge change in altitude in less than 24 hours, especially for such a taxing hike. While I had planned to do a more relaxed hike on my first day here, at the very least to counteract the effects of the aforementioned gorging on cheesy treats, storms were forecast for the rest of the week and I didn’t want to miss out on what looked to be my only opportunity to reach the glacier. I also spent the rest of the day post-hike bundled up in bed feeling like death. Don’t be me! If you haven’t spent much time in the mountains, it’s really best to spend at least a day in Kazbegi to acclimatise or choose one of the many other spectacular day hikes in Kazbegi that stick to lower altitudes. The Weather Is Temperamental | There’s a reason Kazbegi is painted in such vivid shades of green – it receives absolute buckets of rain throughout the year, and the mountain peaks allow storms to brew out of sight, only to sneak up on you when it’s already too late. Considering how long this walk is, how quickly the temperatures can plummet at these altitudes and how exposed most of the trail is, it’s crucial to pay close attention to the weather before setting off and prepare accordingly. Bring Warm Weatherproof Gear | I was lucky enough to set off hiking beneath clear skies which lasted for most of the hike, but by the time I was leaving the glacier, icy winds were whipping off the mountains and the storm clouds were rolling in fast culminating in a torrential downpour and thunderstorm minutes after I stepped foot into my guesthouse. Conditions can change fast and it’s best to be prepared. A thermal layer, warm jacket and a weatherproof jacket are essential at any time of year. Check this post for all my favourite hiking essentials. Wear Proper Shoes | Seriously, the number of people I saw attempting to climb the rain-soaked path to the church in sparkly sandals and platforms was enough to send my eyes rolling. Sure, it’s an easy hike, but it’s still a hike with some short sections of loose scree and mud which can become very slippery when wet, which is most of the time. As a bare minimum, I would suggest wearing sturdy closed shoes to reach the church. For the glacier, proper hiking boots and socks are definitely a good idea. I love these lightweight, gore-tex boots which I saw me through all my hiking adventures in Georgia. Bring Snacks And Plenty Of Water | Another area I sorely misjudged was how much food to bring. I began hiking in the dark in order to arrive for sunrise meaning I missed breakfast altogether and really should have brought a little more to munch on. Nuts, crackers, bread and bananas were all I had for sustenance the entire day which was clearly not enough for such a long hike. There are a few small mini markets scattered around Kazbegi, but from my experience, they didn’t sell a great deal of decent hiking snack food for a proper packed lunch. I’d suggest picking up supplies in Tbilisi instead and just stocking up on the bare essentials and fresh fruit when you arrive. Get An Early Start | To reach Gergeti Glacier, it’s at least a 9-hour hike at a good, steady pace. Add on some time to visit the church, a lunch break and plenty of time to take photos and you can expect to add another hour or two to your adventure. An early start is best to allow enough time to complete the hike, especially if you’re visiting outside of summer when the days are relatively short. You Can Stay At The New AltiHut 3.14 | Having first opened its doors in the summer of 2018, this new mountain refuge hopes to make these mountains more accessible to intrepid trekkers. Nestled in the bowl beneath the glacier, it’s undoubtedly in a spectacular location and offers up wildly impressive views. It also makes a perfect way to break up the hike if it all just sounds like too much for one day or you hope to reach the Bethlemi Hut some 5km further up the glacier. This soft meadowy area surrounding it is also popular for campers looking to break up the trip. For more information, check their website or Facebook. 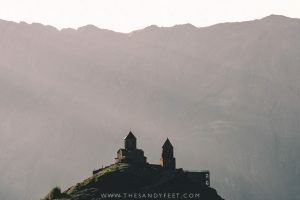 I had grand plans to spend an entire week hiking in and around Kazbegi, but, well, those were pretty much thrown out the window when I woke to torrential rain and next to no visibility. These are some other hiking options in the area that look absolutely beautiful. After gawking at the photos of the Chaukhi Pass area on a fellow hikers iPhone, this was one I was definitely keen to do. Setting off from Juta, there’s the option of a relatively easy walk that leads to the base of Mt Chaukhi, or the tougher day hike which continues up towards the pass. Another option around Juta is the Sno Valley, a wide swath of green that begs to be explored. 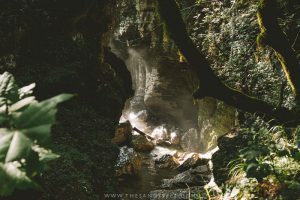 The lush, mysterious and fairly restricted Truso Valley makes it as intriguing a hiking destination as ever. Running toward the border with Ossetia, access can become rather tricky the further you go. Though an expensive taxi was once the only way to reach these off track mountain villages, Mountain Freaks Tour Agency thankfully now operates a daily shuttle bus that runs throughout the trekking season to both Juta and the Truso Valley. Fixed departure times mean you may not get as much time to explore as you may like, but at 30 GEL (€10) for the return trip it’s a convenient and economical way to reach these hiking spots. For further details, check here. Guesthouse Ketino Sujashvili | After getting slightly lost on my way from the bus station, I was welcomed to this friendly guesthouse by a gaggle of lively female hosts who proceeded to ply me with steaming hot cups of tea and Georgian treats. Their slightly pricey dinner spread is fabulous, as is the breakfast of bottomless mini pancakes, cups of tea and tasty Georgian fare. Dorms and private rooms are available at very budget-friendly prices. It’s also worth noting that this place is marked incorrectly on most maps. On Maps.Me it’s actually marked twice – the one furthest from the bridge is correct. Rooms Hotel | For those looking to splurge, Rooms Hotel is one of Georgia’s most renowned accommodation options with a simply gorgeous setting, unbeatable views and a spacious outdoor terrace to enjoy a well-deserved drink at the end of the day. It’s quite pricey by Georgian standard but makes a perfect spot if you’re after somewhere a little bit special in the mountains. Or check out the full range of wonderful guesthouses available in Kazbegi here. 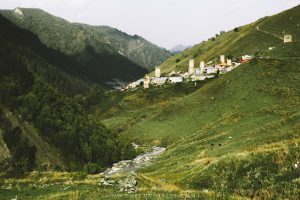 As with most things in Georgia, there are two ways to get from Tbilisi to Kazbegi – by taxi or marshrutka. Both leave from Didube Bus Station which, as far as huge, chaotic Georgian bus terminals go, was by far the most overwhelming one to navigate. But once you know what’s going on, it’s actually relatively well organised and broken up into a series of grids. To get to Didube Bus Station, take the metro from the city centre and jump out at the Didube stop. From the platform go down the stairs and to the right through the underpass (not up the stairs) which will lead you directly into the main bus station area where marshrutka to many of the main tourist destinations will be waiting. The marshrutka for Kazbegi, however, is a little further along. Continue walking straight through this block until you see a row of market stalls on the right. Turn right to go through these stalls until you reach another block of marshrutka. Turn left here and the marshrutka for Kazbegi should be waiting at the end of this row before the next set of stalls, clearly signed in English and Georgian. If you’re feeling really lost, once you get through the market stalls there should be a little booth in the right-hand corner of the block clearly marked with a blue sign saying ‘Cash Desk’. You can’t buy a ticket here but if you ask for Kazbegi, they should be able to point you in the right direction of the marshrutka. This ticket counter is also marked on Maps.Me if you get completely disorientated. You’ll need to buy your ticket onboard before departing (10 GEL/€3.50) and I’d highly recommend choosing your seat as soon as you arrive to avoid being given the dreaded back row. Marshrutka leave when full every hour or so and take around 3 hours to reach Kazbegi with a bathroom and snack stop along the way. As you make your way through Didube Bus Station, you’ll most likely pass a few smaller vehicles signposted for Kazbegi as well. These are the taxis and generally offer to make some stops along the way for you to take pictures for around double the fare of the marshrutka (20 GEL). 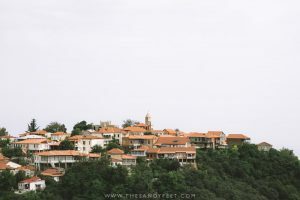 Depending on how you like to travel, and whether you can fill the car, this is actually a pretty good deal as the scenery along the drive is fantastic. Be prepared for taxi drivers to approach you as well and try to convince you to go with them. If you’re set on the marshrutka and are just lost, stand your ground and try to navigate toward the correct bus lot.